please click on each pets profile to check if there is any special pricing and dates they will be available for adoption. Adult Dogs 1+ years of age or dogs NOT coming on rescue program $200 -$525 (click on individual pictures for adoption fees). The shelter accepts VISA, MasterCard, Discover, debit cards or cash. One Month Trial of Insurance; (Accident and Named Peril Illness Coverage) – 30-days at NO cost to adopters. Adopters must enroll online or via phone within 7 days or adoption. Payment information must be provided at the time of enrollment (adopter must include credit card information – ADOPTER WILL NOT BE BILLED FOR THE FIRST 30 DAYS). At the end of the first 30 day Trail, the 12 month plan will continue automatically unless cancelled. $3,000 of coverage per annual term, available for accidents and specified illnesses during the trial period. One time deductible of $150 per policy term. Your Adoption Fee also covers a PORTION of the transport fee for any pet/s that come to our shelter via transport (whether they are flying or driving) – this fee averages $150-$200 PER animal. Our shelter has only increased adoption costs to cover less than 1/3rd of the transport fee. Adoption Fee also covers any pets (for dogs/cats/puppies/kittens) that come to our shelter via transport (whether they are flying or driving) – which averages $150-$200 PER animal. 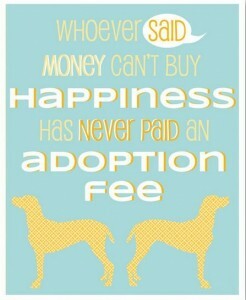 All adoption fees are subject to change without notice. The shelter reserves the right to charge more or less for purebreds, puppies, special medical conditions, etc. The shelter reserves the right to deny an adoption to anyone for any reason at any time. License your pet according to your local laws and have him/her wear an ID tag at all times, showing your name, address and phone number. Make your sure pet is an indoor pet only! Your cat or dog should live inside where its safe. Keep your dog or cat on a leash or under your control whenever you take him/her outside for exercise. This will protect your pet from injuries caused by cars, other animals or theft. Spay or neuter your pet. This will help him/her healthier and will reduce the problem of dog/cat overpopulation. Give your pet a nutritious diet, including constant access to clean water. Provide your pet with plenty of exercise. Be sure your pet receives proper vet care and keep up with the necessary vaccination. Train your pet patiently and give him or her lots of praise and attention. Groom your pet often to keep their coat and skin soft and shiny. Have realistic expectations about your pet. Nobody is perfect. Make a commitment to work through behavior and health problems that arise. Don’t just get rid of your pet! Visit your local animal shelter when its time to bring a new pet into your family. Have you really considered the cost of pet ownership? Listed below are things you should consider before adopting a pet. Please read carefully and decide if you are ready for the commitment and responsibility of owning and properly caring for a pet! Having and loving a pet is not a right, but a privilege! The following items reflect the average costs of properly caring for a 40-50 lb. dog. Larger dogs cost a bit more, small dogs cost a bit less. This list is for information purposes only. Obedience training (highly recommended!) – $120 for an 8 week program. Some programs offer discounts for rescued pets. Fencing – Actual or Electronic can cost hundreds or thousands. Did you know that we offer low cost Spay/Neuter, Vaccine, and Dental Services? Help keep our shelter running! Donate Today! The Animal Shelter Inc. of Sterling, Massachusetts is a non-profit organization and no-kill shelter. The shelter provides humane sheltering and care for stray, unwanted, abused and neglected animals. Learn More. Over 9 million cats are surrendered to shelters for litter box issues…try these tips to solve YOUR kitties issues! Now you can get pet-behavior advice from ASPCA experts 24 hours a day, right from your computer. This nationally recognized team of animal behaviorists offers possible solutions to a wide range of issues at no charge. Simply type your pet’s behavior problem into our easy-to-use database, and you’ll receive step-by-step advice — without leaving home! Having Trouble Affording Medical/Emergency Care for Your Pet? Check this list for resources in your state a comprehensive list of pet financial aid-related organizations. © 2019 Animal Shelter, Inc. of Sterling.